It’s Oscar deliberation time and the 10th Annual "For Your Consideration: a Selection of Oscar Submissions from around the World" will be featured in an exclusive San Francisco Bay Area series of 14 films from 14 countries for the 2012 Best Foreign Language Film. Of 71 films sent to the Academy as the best film of each country, this special event has selected some of the best of the competition. The event will be held Jan 11 - 17, 2013 at the Smith Rafael Film Center in San Rafael, CA. It is the story of a 12-year-old girl who is abducted by a rebel army. Two years later she is with child from the commander who believes she has special powers and knows when the enemy is near. For this she is called a witch. Rachel Mwanza won the Silver Bear for Best Actress for her role. She plays a child soldier who is asked to murder by the soldiers to test her loyalty. Witch is befriended by a young boy her age called Magicien. The children grow up fast and hard. The filmmaking is brilliant and the story moving, which makes it a strong contender for this year’s Best Foreign Language film. "Kon-Tiki" by Joachim Rønning and Espen Sandberg from Norway is also on the short list. It’s not hard to understand why Pièta the third film, did not make the short list. Its sexual violence and symbolic plot would never find the Academy behind it. Kim Ki-duk won the Golden Lion at Venice this summer for the film. It is completely different from his previous film that also won a special director's award at Venice in 2004 - "3- Iron" about a young man who comes to the rescue of a woman beaten by her husband. "Pìeta" is not without artistic value and many of the shots are artfully arranged but the story is about a wayward boy and his mother whom he mistreats in punishment for her abandonment. For Kim mother and son evoke the Virgin Mary and Jesus, as exemplified in the famous Italian sculpture by Michelangelo at St Peters in Rome. Coming to Venice with a film like this was somewhat of an intellectual appeal to be noticed. It was, but divided the critics even in winning the top award. One other film worth mentioning on the short list is "Sister" by Ursula Meier about a young boy who tries to survive by stealing ski supplies in a resort in the Alps. The film was recently reviewed on Movie Magazine with an exclusive interview with the director. 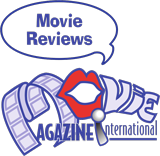 "Movie Magazine International" is a weekly, nationally-syndicated radio program which features movie reviews, film festival reports, star tributes, weekly trivia contests, ticket giveaways, and interviews with directors and actors from yesterday and today. This blog contains all of our articles since July 2009. Please visit our main website to read our older reviews, learn more about the radio show, or view our interview schedule.